One of Connelly's best! Once you begin reading you won't be able to stop until you've finished. 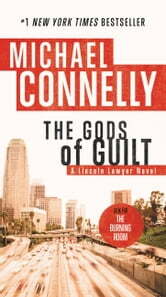 I enjoyed The Gods of Guilt very much and I can't wait to begin the next of Connelly's Lincoln Lawyer novels! I love reading the Micky Haller series. Once again a well written plot that keeps the reader in suspence while they travel with Micky through his own personal difficulties and his some times, surprising efforts to help others. Good characterisations and story lines. I hope Michael Connelly keeps building on the Mickey Haller series.